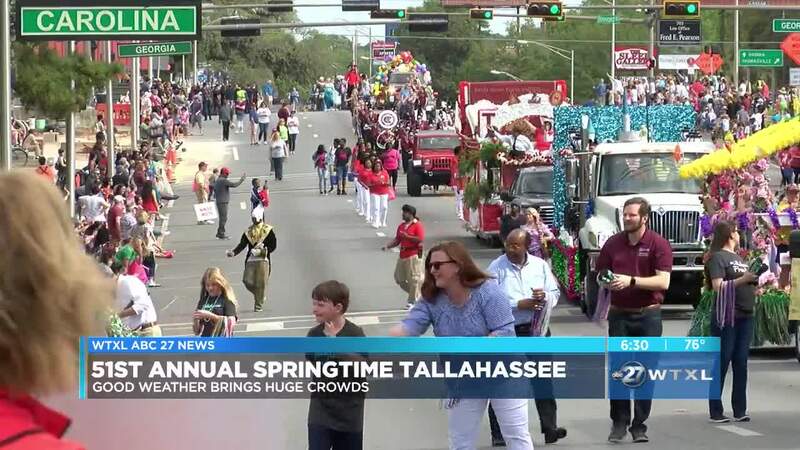 About 150,000 people filled the streets of Downtown Tallahassee, a big increase from the year before, which had rainy weather. The bad weather forced the Jubilee to be canceled and less people showed up for the parade. Luckily, weather was perfect this year. "The weather this year is awesome" said Joan Fowinkle. Joan Fowinkle has attended springtime Tallahassee for many years including last year. She says the weather wiped out the usual big crowds, and dimmed the normally upbeat atmosphere. "When I moved here from San Diego I was heart broken, I love Tallahassee now, and what made me love Tallahassee 25 years ago was Springtime." said Joan Fowinkle. Vendors noticed a difference as well, since the Jubilee was canceled last year. A day that full of excitement and good vibrations. "I'm so excited to do this because there is so much noise. It just makes me want to go Yippee I'm here." said Katie Rose. Another successful year for Springtime Tallahassee.